1. Air archetypes: These are some of the prime candidates for using the air strip. You've already brought the air, which means you've probably got some units at the land-base. You may need some extra Cap for that bomber or high end fighter, and might have the right air units to reasonably use the airstrip. 2. Sub fleets: This is a good candidate for the airstrip because they usually have at least some air in the fleet and make judicious use of the landbase. Supplementing with the airstrip can bring more fighters over your ships and subs. 3. Ship swarm archetypes: Much depends here on whether you've bothered with air at all. Plenty of people do not. Placement difficulties abound unless you bring a lot of air. You're probably better of bringing cheap fighters at the land-base and skipping the airstrip altogether. 4. Battleship fleets: These fleets are decent candidates for use of the airstrip, but really depend upon how you plan on building around the battleships. I sometimes have a bit of air so that I get a bit better placement on the defensive fighters. The airstrip could be useful here. 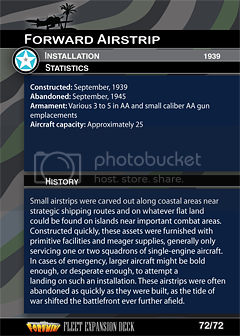 Air can also be useful in eliminating swarm units before they overwhelm your battleships, and the airstrip can support that strategy. If you're going more of a battleship-swarm hybrid, then the land-base is probably the best place for defensive fighters. 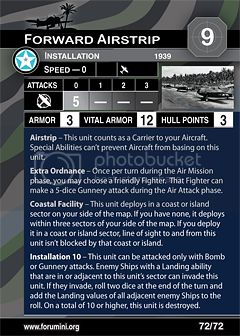 The company Litko Game Accessories offers two possible options for representing the Forward Airstrip in a game of War at Sea.